Ever since the inception of the Vance and Hines Harley-Davidson V-Rod in the NHRA Pro Stock Motorcycle class, the unique marvel of engineering has been a major topic of conversation and controversy. In the V-Rod’s infancy in the early 2000s, the big question was, could such a machine even qualify in a Suzuki-dominated class? After several years of hard work by Vance and Hines and rule alterations by the NHRA, the V-Rod has become one of the most dominant and popular motorcycles in the category, amassing multiple event wins, the first sub-seven second run and four championship titles. Detractors are outraged that the V-Rod is the only vehicle in NHRA competition that is not available to the public. 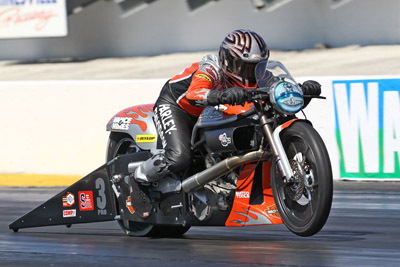 Only Vance and Hines can own, build and race a NHRA-legal Harley-Davidson V-Rod. Adding to the controversy is the fact that Vance and Hines supplies engines for the overwhelming majority of PSM racers who compete on Suzukis and V&H has also entered the PSM Buell market. 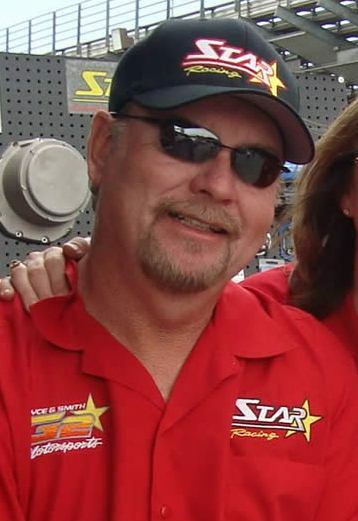 Perhaps the most outspoken critic of the situation is Star Racing owner and six-time NHRA champion, George Bryce. Make sure to read Bryce’s Cycledrag.com interview on this situation and listen to his RPM tonight interview (Sep. 21, 2011) to better understand the 78-time event winner’s argument. This issue has come to the forefront once again with the recent war of words between Vance and Hines rider Eddie Krawiec and Suzuki racer Jerry Savoie, who has asked how Krawiec can be proud of winning a race on a motorcycle no one else is allowed to compete on? Those questions are moot compared to the harsh reality of why this unique situation exists in NHRA PSM; the class simply isn’t popular enough. That statement may not sit well with most visitors of Cycledrag.com, a site dedicated to drag bike racing. I love PSM and, most likely, you love it too. Bryce loves it. Vance and Hines loves it. Unfortunately the masses do not love it. Don’t believe me? For the next NHRA national event, let’s make an announcement that the only class competing throughout the weekend will be PSM. How many spectators will show up? What will the ratings be for the NHRA television show? There is no question the event would fail miserably. Now let’s pretend NHRA makes the announcement that PSM will not compete at the next event. I bet NHRA doesn’t see more than a 3-5% drop in attendance, if that. In fact, Top Fuel alone would probably bring out at least 80% of the fans who planned on attending. The harsh reality is PSM is not a huge money maker, it’s not a draw. It never has been and likely never will be. Major corporate sponsors are not lining up to get involved in PSM. The class is there to serve as a side dish to NHRA’s main event, Top Fuel and Funny Car. So how does that play into the NHRA PSM Vance and Hines V-Rod controversy? Is NHRA aware that V&H being the sole owner of the V-Rod is a bit unfair? Sure. It doesn’t matter though. NHRA exists to make money. NHRA is only concerned about the big picture and having America’s most popular and marketable motorcycle manufacturer, Harley-Davidson, associated with the class is a wonderful thing. The class may not even exist otherwise. Can you blame NHRA? No. Harley-Davidson is an enormous, billion-dollar company that is only involved with NHRA as a small marketing and advertising project. Harley’s NHRA involvement is a minuscule blip on the company’s radar compared to all of the business it does on a daily basis. Clearly to Harley-Davidson, letting anyone but Vance and Hines own, race or build a V-Rod in PSM isn’t worth the risk. We all know George Bryce, who has represented successful companies like Winston and S&S, would make Harley proud. But what about the wealthy, less-than-skilled rookie racer who could buy a V-Rod and possibly do damage to the Harley brand by breaking or not qualifying, tarnishing Harley’s NHRA involvement? The marketing project wouldn’t make much sense for Harley at that point. In reality, damage to the Harley brand by poor PSM performance may not be plausible, but clearly it’s not worth the risk to Harley. Can you blame Harley for wanting to get the most out of its investment? No. Vance and Hines is a company that has been involved in PSM since the beginning. Byron Hines and Terry Vance have ensured the PSM class has remained part of NHRA over the years. NHRA has shown they are not afraid to cut a non-nitro class that doesn’t greatly contribute to the gate or bottom line of the company (See Pro Stock Truck). 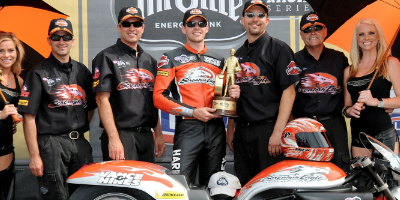 Vance and Hines established a connection and a high level of trust with Harley-Davidson to convince it to race in the NHRA. The battle in PSM is as much about making business deals and obtaining sponsorship as it is about cutting lights and tuning engines. Is Vance and Hines supposed to turn its back on Harley because Harley only wants to do business with V&H? No. The Harley-Davidson deal has elevated the popularity of Pro Stock Motorcycle and has been financially successful for V&H. Can you blame V&H for taking the deal? No. The NHRA V-Rod may be the dominant machine and many believe Vance and Hines controls the entire class, but let’s not forget the parity could be a lot worse. The V-Rod didn’t win eight championships in a row. Last year L.E. Tonglet won the season crown on a Suzuki and Matt Smith and Hector Arana have won the title on Buells. And finally, does George Bryce has a valid point about the rules not being fair and the injustice that exists with only one team being able to race a particular type of vehicle? Yes. Bryce has dedicated his life to the sport. He is not used to losing. He has won championships with the great John Myers and Angelle Savoie. Can you blame Bryce for wanting to own the equipment he feels gives him the best chance of winning? No. Anyone who investigates the rules should be able to conclude that the situation in PSM is not 100-percent fair. It is not an ideal competitive environment. Such a situation would never exist in a highly-successful, large spectator attraction like the NFL. The Pittsburgh Steelers wouldn’t be allowed to use one-of-a-kind spikes, helmets or shoulder pads to its advantage. But then again, people pay billions of dollars to watch NFL players compete on an even playing field. PSM is lucky to exist at all. It’s a niche within a niche. What’s fair and what makes money can differ greatly. The harsh reality is, as motorcycle drag racing fans, we are fortunate to have PSM as part of the NHRA lineup. We are fortunate drag bike racing can be seen on ESPN. We are fortunate Vance and Hines has dedicated over 20 years to the class. We are fortunate George Bryce and Star Racing have greatly contributed to PSM and are passionate enough about winning to cry foul. We are fortunate a juggernaut like Harley-Davidson is involved in the sport and continues to pour money into the class. This might be the one thing NHRA, Bryce, Vance and Hines, Savoie and Krawiec can all agree on. The buzz and controversy surrounding the issue is also good for the class. The situation is not perfect, but it could be a lot worse. Motorcycle drag racing fans, it’s the best we have and it’s a lot better than nothing. I agree with everything you say in this article and sadly this means that the sport of PSM is nothing more than a hollow “show” and is no longer a competition. No self respecting Harley supporter can come to the office on Monday morning and pridefully rub the weekend win in the face of the Kawasaki and Suzuki faithfuls. Tell me one other Motorsport that allows head to head competition while giving one side a 60% displacement advantage? Even other motorcycle motorsports don’t go “that” far outside the box. What would happen at the start of the 2012 season if Suzuki and Kawasaki(why aren’t there any Kaws in PSM? )racers didn’t show up to race in protest? Suppose the refuse to play by the lopsided rules anymore? How long would PSM last??? If you think Harley Davidson is responsible for keeping PSM alive..you better think again. It’s not cheap to race in that class!At some point racers and sponsors will realize what a waste of money it is to try to compete in a lopsided war every season. Why are the puppet masters(V&H) allowed to dictate who wins and loses championships? They decide which of thier motors is going to win the championship. They pull back the HD’s and let the Suzuki’s win to shut them up and make the fans think that the playing field is even. NHRA PSM is a farce. It’s really the Vance and Hines PSM racing show. Starring Vance and Hines! Good take. Kawasakis have never really been competitive in modern era PSM. Geno Scali was able to win some rounds on Pete Briggs’ KZ-based bike ten years ago but they were always at a disadvantage. Rob Muzzy sunk a fortune into developing a ZX-14 for the class but Muzzy eventually put the project on hold because he felt the rules were not giving him a fair chance. As far as people not showing up goes, it could happen. Not necessarily due to the unfair rules either. There isn’t much money available in the class and it costs a fortune to compete. Even if you already have the equipment how do you justify the $150,000 you will spend in fuel traveling all over the country if you dont have a sponsor? George Bryce and Paul Gast live for the sport and both have plenty of money, but neither one of them feel it’s worth it to race PSM. How much longer will Matt Smith be able to continue without a sponsor? Craig Treble is one of the most talented racers in the world and he can’t afford it anymore. With a horrible economy and controversial rules, the class is in real trouble. I could see them have to go to an eight bike field someday when only 12 show up, or cut the class altogether. It should be a level playing field. Let the Buel’s have 4 V cyl heads. & save money & that is paramount in the US economy in these tough times. Give the racers a Fair Deal. Fair Competition & a chance To Win. That may well have been the Australian way years ago, but ANDRA in Oz hasn’t adhered to that principle either. The mighty dollar talks, and the less popular classes don’t seem to evoke much care factor. I used to be a Chief Steward and successful racer, but gave it away in disgust in the end. It’s hard to think that the almighty dollar is the bottom line for hd, vhr, and the nhra, even though I know that to be true. What bothers me most is the fact that more Sponsors like NITROFISH will pull out for the same reasons!! If you don’t have a snowball’s chance of winning a championship, why throw away your money…on the remote chance that vhr MIGHT…MIGHT make a MISTAKE??? I know that even a blind dog will find a bone sooner or later, but how many of the sponsors will risk the odds? You’d be better off just disolving the PSM class and go back to brackets! At least the good teams would still have a chance at an event win! I’d hate to see it, but it may just be the only way to eliminate hd! Great read, kinda told it the way it is, a non-sugar coated emotionless evaluation on the current condition has been needed for a while. Funny how my recollection of the v rod story goes more like this.. Hines gets tired of beign beat by a girl and finds another way to win by introducing a new bike with a huge displacement advantage that only he could have, alowing him to sandbag his way onto multiple championships. You undersell everyone elses achivements by continuing this spun up a story about saving the class with the v rod. Nothing could be further from the truth. Nothing could be further from the truth? Hey Shag I don’t think you realize how close NHRA was to cutting this class out altogether. They don’t need it. PSM is not a big money make. NHRA needs the Harley Davidson funding to make it worth it. I agree 100%. PSM is not even close to the most exciting class in motorcycle drag racing. I’d love to see Top Fuel. Imagine if they could find a way to work in the import bikes too? If they slowed McBride down to 6.20-6.30s, it would be one heck of a show. Nothing against Prostock Bike but when the fuel bikes come up i do not see that many people going to the bathroom . hd Top Fuel? They can’t even compete head to head with the 4 cylinder Top Fuel motorcycles. The hardlys are over a second plus off the pace of a Mc Bride, Hogan and the real Top Fuel motorcycles. Lets face it, hardlys can only be in the same arena if they are given very special considerations with NOT just a cc but CI advantage, weight breaks, not a single component on their engines are OEM and everything short of just giving them the damn trophy/championship(s). While I agree with with most of the points in this article, I do think it is an oversight not to at least consider that while Harley has bankrolled this class, Harley itself, is at least partially responsible for stunting it’s growth. I have always loved the NHRA bikes, but with a manufacturer exploiting an unfair rule advantage, I have used this event for a restroom/concession break and will continue to do so every year at the Fall Nationals. PSM was my favorite class until the HD’s came along. Now I refuse to watch unless a Suzuki is running. I hope NHRA reep what they sow..
the jap bikes are just too weak,they make harley add weight so the jap bikes can even be competitive.the real problem is nobody likes jap bikes in drag racing because they have an annoying whine which nobody wants to hear.lets face it the jap bikes are all export parts on them because they are made to cheaply to stand up to all the power needed to beat them harleys!! Jap bikes you stoopid Redneck are all original factory cases from the early 1908s where as you hardleys are all one off billet, unobtanium custom works of art from the industries premier shop. If your hardleys had to use the stock cases, crank and heads they would blow up on the very first pass. Dumb haole. All of NHRA (nascar too) is run by corporate money, TF< Funny Car is run by DSR and John Force.The monopoly of these teams and VH will be the downfall of all racing. NHRA should take a good look at Pro-Stock cars, lots of teams and variety, this is what fans want to see.As a fan of drag racing I would like to see the same rules applied for all racers, makes for a better show and that's what sells tickets. Whine, whine, whine. MOPAR dominated NASCAR with the design of the Superbird, lapping the competition. Pretty soon NASCAR bowed down before GM answer Ford, disqualified Dodge and Plymouth in a politically motivated money move to stop the crying losers. Design the best and own it, or shut the hell up. I hate how losers always get their way. Interest and attendance is down BECAUSE of the Harleys. This was nothing but a knee jerk reaction, on NHRA’s part, back when they first came on the scene. The economy was in bad shape and they needed the $. It’s not true now, that’s nothing but an excuse. The so called V-Rod does not have a single Harley part on it, so how Harley justify putting their brand on it? if all the riders in psm would stick together, boycott the rest of 2016, and dont show for the balance of 2016. There is another v twin co that is building their own engine, and is already approved for PSM in the NHRA. Being stale, not listening to public input could come back to bite the ole motor company is the arse. With Victory already sponsoring 2 riders, it will be less than 3 years, PSM will be brought to you in the NHRA via Victory motorcycles.